Captioned 'Beyond Words', have a look at this rare picture of two greats from opposite ends of the world, taken 82 years ago. 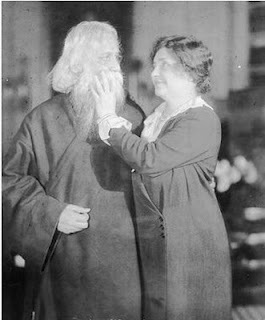 "In this rare photograph from The Hindu’s archives, Helen Keller, the blind American author and labour rights activist, greets Rabindranath Tagore at a meeting in New York in 1930." One is always surprised at the preoccupation with gold, the infatuation, craze and passion for the yellow metal in India, and elsewhere. The WGC (goldDOTorg. Ha Ha.) happily encourages any and all kinds of marketing gimmicks, including the kind about which Raji ranted in blessed-if-you-buy-jewellery-day. Staying in Kerala, you simply cannot avoid lengthy TV commercials and full-page newspaper ads by gold 'supermarkets' (how vulgar that sounds!). Nor can you miss seeing driver-distracting, really loud hoardings and flex boards. Since women model the trinkets, it seems as though the model, the ad agency and the advertiser are happy to cover much more of the skin with metal than with cloth. You will end up wondering if metal looks best without other wear around hindering the view. So there is demand. And there are sales. Implies that people have money to acquire that metal. We now have (further!) official confirmation of the Digital Divide in India. Hardly 6% of households in urban India households have an Internet connection. This figure reads as 0.4% for rural India. Does this indicate infrastructure falling short or inability to afford the minimum (by today's standards) technology? Or a dismal combination of both? Any talk of inclusive growth is at best laughable. You and I have the luxury of exploring 4G, e-social networking, shopping and seeking entertainment online when other 93% of our city and country cousins are nowhere near this kind of digital empowerment. Read Internet revolution bypasses rural India: Survey. To the average Internet-empowered home, the connection has become somewhat of a necessity. But among all the gigabytes that we devour daily, let us spare a thought for others for whom the Net is still a distant dream or a last priority. Life after the Civil Services Exam? Every year, we read stories about young, successful civil service aspirants with professional degrees and how they cracked their exams and interview. What happens to them later? Say a year down the line, after their training at the elite Lal Bahadur Shastri National Academy of Administrationand when they reach their coveted assignments and postings. Sincere wishes to the soon-to-be national administrators. Will they redefine 'Babus' and 'Babudom' to better emulate Bapu and his ideals for the sake of the nation? The entire coconut tree and its constituents are usable during their lifetime and indeed in their afterlife.